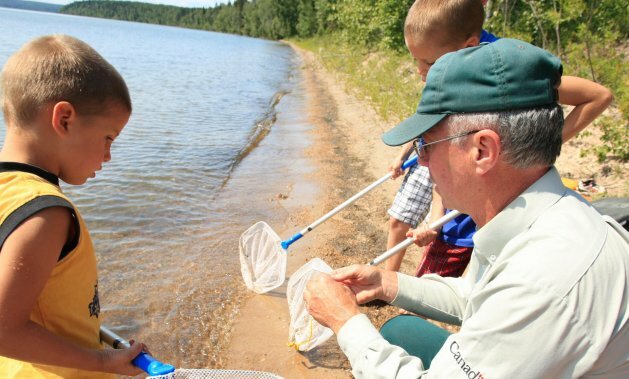 Your visit to Prince Albert National Park might just be the most enjoyable highlight of your entire vacation. This park has a bit of everything—exhilarating scenery, cultural significance, a variety of wildlife and a choice selection of recreation opportunities for all ages. If you’re short on time and looking for an easily accessed trail, you will want to pay a visit to Boundary Bog. Enter a black spruce bog and see botanical wonders, such as delicate mosses, varied types of woodland terrain and even four different species of carnivorous plants. If you wish to embrace the history and culture that this park represents, Grey Owl’s Cabin is another must-see. This was the lakeside lodge that housed Canada’s first conservationist, Grey Owl, and it can be accessed by hiking to the site or by paddling along the tranquil waterways. Take an excursion to Valley View on the west side of Prince Albert National Park and you’ll be thrilled by the view you find there. See wild plains bison, hike through long sedge meadows or go for a bike ride through this marvellous territory. The Waskesiu townsite is another place where you can stop and relax. It’s the perfect spot to get a coffee or an ice cream and take in a sunset on beautiful Main Beach. The visitor centre here is staffed by knowledgeable folks who will gladly answer any questions you might have. If you are still looking for more outdoor activities, there are plenty more options available. Hikers should take note of Spruce River Highlands, especially in fall when the rolling hills and meandering trails are ablaze with autumn colours. You can also paddle the Waskesiu River starting from the main marina, and see all types of wildlife, including bald eagles, beavers, river otters, blue herons and more. The Narrow Peninsula Trail is another popular choice for hikers, and the Heritage Driving Tour brochure can guide you to interesting sites along the way to the trailhead. Don’t forget to explore Fisher Trail, another beloved boreal forest trail in this lovely park. For more information about the park, contact Prince Albert National Park by phone at 306-663-4522 or by email, or visit the park's website. The Nature Centre offers a wealth of activities and games that encourage youngsters to learn about the wildlife and geography of the area. You can find the Nature Centre in Waskesiu, just a short walk, bike or drive from most campgrounds. Pick up a Parks Canada Xplorers booklet at the Nature Centre, Visitor Centre or campground kiosk. Kids can use it to explore the park through a series of fun activities, and can even receive special souvenirs after completing them.